Following the success of their latest album Dear Desolation and a string of sold out launch shows, Thy Art is Murder have just announced that they will tear up their homeland once more in February 2018. 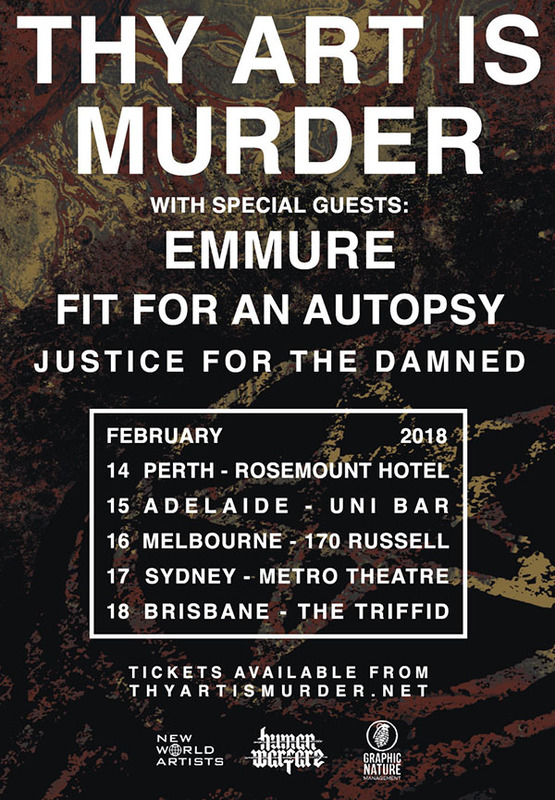 For this momentous lap of the country, Thy Art bring two huge international supports, the new-look Emmure, Jersey's Fit For An Autopsy, as well as local heroes Justice For The Damned. The success of Dear Desolation, which smashed in at #5 on the ARIA Charts last month, came as no surprise to those that have been following Thy Art is Murder's exceptional trajectory. The band's unrelenting aggression and blatant refusal to let anything stand in their way, has cemented them as one of the most enduring and driving forces in extreme music, as well as one of Australia's proudest exports. To officially celebrate Dear Desolation, Thy Art Is Murder will play five shows around the country, accompanied by some of the biggest names in heavy music. Emmure will bring their new line-up to our shores, giving fans a taste of their new album Look At Yourself which was released earlier this year. After a solid year of touring in both the US and Europe, long term mates Fit For An Autopsy are pit fit and more than capable of rattling the foundations of some of Australia's live music meccas. Rounding out this massive bill will be Sydney five-piece Justice For The Damned. These guys will be cutting their teeth on tour throughout Europe with Thy Art Is Murder later this year. This baptism of fire is expected to evolve into a full blown inferno come February. Tickets on sale 9am Friday 15th September.